You’ve developed a relationship with plenty of NFL players over the years through fantasy football. Deny it all you want, but I can guarantee you there’s someone on your team, right now, that you’d take a bullet for. You drafted Jamaal Charles in 2009. And since then, you’ve had dinners together, saw a couple of action movies and shot some pool at a local bar. He’s been with you since that August 2009 evening. You were hammered drunk, and may have sloppily selected him in Round 12. But you got him, and you haven’t looked back since. There comes a point in time, however, where you need to let go. Deciding how to break up with them is one thing, but knowing when the time is right is another. Keepers aren’t meant to last forever, and there are signs that point to the end of your relationship with your keeper. You just have to ask yourself some questions. Did my potential keeper have a flukey season? Every player needs to have some sort of breakout season in order to be considered a keeper. The question here isn’t about that, but rather if that breakout year came at a random point in a player’s career. Let’s use an example. We all remember Brandon Lloyd’s monster season with Denver just two seasons ago, where he snagged 77 catches for 1,448 receiving yards under the direction of Josh McDaniels. The casual fantasy player, however, may have had zero clue as to where Brandon Lloyd actually came from. I, as an NFL diehard, remembered Brandon Lloyd’s first seven years of his career. I remember his ridiculous highlight reel catches, and I completely understood that he was a monster talent at the wide receiver position. He just never brought it all together. Until 2010, of course. But why trust him after one Pro Bowl season when we saw him have seven seasons of mediocrity? Sure, we can blame his quarterback performances, or the fact that he didn’t get a lot of opportunity, but isn’t that all part of the game? You have to be smart. Research your players. See if your breakout keeper had a slow buildup to greatness, or if he was in the right situation at the right time. That happens. I shouldn’t have to explain myself here, but we all know James Jones is putting up the numbers he is because of injury and opportunity. Throughout his career, Jones hasn’t been anything more than a matchup play. And while Greg Jennings may end up leaving the Pack for a different opportunity, we must remember that Jones has had five seasons of moderate receiver play. If there are better options, Jones shouldn’t be considered a keeper, even though he’s currently a top-15 wide receiver. How will my potential keeper be used next season? You have to play a little Nostradamus. This question is hugely important with running backs, as the life span of the position is so much shorter than the other key fantasy slots. When you’re selecting a keeper, don’t simply look at how that player performed in your present season. What if he’s stepped up due to injury? What if he’s a running back and reaching the dreaded 30-year age mark? What if his contract is due to expire, and he’s entering free agency at the end of the season? If we were to only look at a snapshot of one season, then someone like Darren McFadden would more than likely not be kept moving into 2013. He’s had a below average season and is now nursing a high ankle sprain, but we know that he’ll be back and be used heavily next season. Whether you want to keep him because of his injuries is a completely different discussion. One key element to this question is to pinpoint the players who are in a position to take a larger role in the subsequent season. You may be able to get them fairly cheap before the 2012 ends, and the fantasy manager who owns this player may not have the comprehension to see past 2012. Spiller is currently devalued because of his split usage with running back Fred Jackson. Yet we’re all completely aware that he’s the younger, more talented back in Buffalo. If I’m in a keeper league, and Spiller’s owner may not be aware that Fred Jackson is on the decline, I’m taking advantage. I’m getting Spiller for 2013. Does my potential keeper play an important position? If you’ve read my blog, you’re already aware that I not only devalue the quarterback position in fantasy football, but that I also love running backs. You need consistent, every down backs in fantasy football – more than anything else. Position “importance” comes down to replaceability. And, if you understand the basics of supply and demand, you’d be alert to the fact that quarterbacks are replaceable. Your typical fantasy lineup just starts one of them, so you need less of them. That’s why my typical strategy isn’t to keep a quarterback. I made the mistake this year in a league of keeping Matthew Stafford for a fraction of my draft auction budget, moving away from any logic and belief I previously held. Big mistake. Not only has Stafford had a middle-of-the-road season, but I could’ve easily searched the waiver wire for someone just as good. I now look at it more as a case study than anything else (not really – I sincerely screwed up). I’d have a very difficult time ever keeping a quarterback if I have the option of keeping a different position. This is all simply due to replaceability. In August, you drafted Andrew Luck in Round 11. Your keeper rules state that, of the two player you can keep, you simply keep them and lose the draft pick in which you drafted them the previous year. Do you keep Luck? Well, sure, because then you’re instituting the late-round quarterback strategy with an early-round, efficient quarterback. 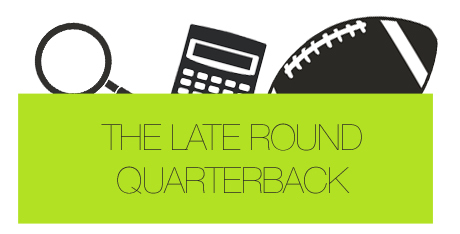 If you have other late-round options, however, you may want to think twice. That’s all I’m saying. You need to understand the overall importance of the quarterback position before moving forward with one. Where will my potential keeper be drafted next season? As I just pointed out, each league has its own unique keeper rules. You have to know and understand the value of your keeper before officially selecting him. Again, I like examples, so I’ll use another one. In my “main league”, we keep two players. We do auction drafts, so the value of the players are equal to the price we paid the previous season times a 10% inflation rate. Any player that was acquired off the waiver wire can be kept for $1. In this 14-team league, Trent Richardson was drafted for $53 of a team’s $200 budget. Next season, he’d cost $59 (we round up). The team who drafted Richardson may determine his 2013 value to be around $75, so there’s a slight bargain in keeping him. But what if that team also has Alfred Morris and AJ Green? Green could be kept for $15, as he was drafted at a bargain during his rookie campaign, and Alfie, off the wire, could be kept for just a single dollar. While we may not understand Morris’ usage next season, don’t you think it’d be advantageous to keep him over Richardson? Don’t simply keep the best player, because he’s often the most expensive. Keep the most valueable player. If I’m the team above, and I keep Morris, I’m still able to get Trent Richardson. It’s not as though he’s completely lost. Think through this logically, and ensure that you’re getting the best deal. You may think keeping your best player is the best way to go – but at what cost? Many leagues institute the rule that, wherever you selected your keeper the previous season, you lose that pick in the upcoming draft. My advice? If you don’t own a projected first-round draft choice, don’t keep one that you selected in the first round! For this question, you must always keep value in the forefront. It is, after all, the most important word in fantasy football.